It's been told a photograph says a thousand words. This one united a thousand hearts. One snapshot captured the desperation of a dog, the state of animal shelters and the fate of too many canines housed there. In a word, the picture of Nico is epically heartbreaking. 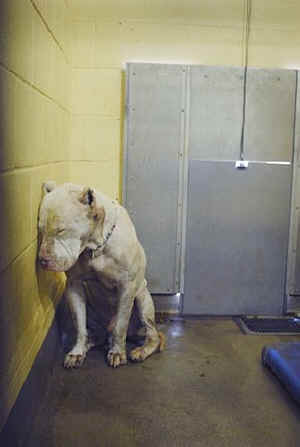 This six-year-old Dogo Argentino is shown with bowed head, leaning against his kennel wall, looking like a beaten, depressed, dejected and forgotten creature. Perhaps you've seen it. If you have, you haven't forgotten. This is how Nico looked in the shelter. Nikki Audet's photo caused a huge Internet wave that eventually saved Nico's life. The story might have ended there. But when rescue volunteer and photographer Nikki Audet with The Mutt Scouts posted the photograph online to garner attention and hopefully spark someone into action, something amazing happened. Nico's picture went viral, starting with Facebook. Suddenly, he became the unofficial poster dog for homeless canines, reminding rescuers who they fight for every single day. And Nico needed that kind of fight. 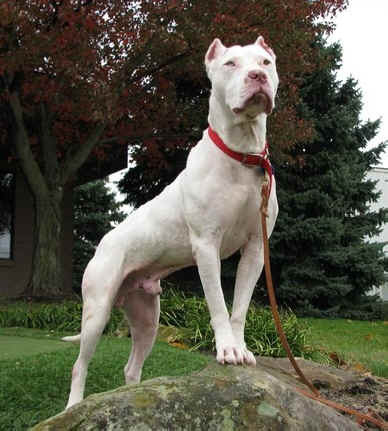 He was a mess: depressed, malnourished, beaten up, bloody, deaf and a "bully breed" to boot. He also had a large tumor on his back, even more visible due to his emaciated frame. He didn't stand a chance of getting out of the shelter. Until that photo of him went gangbusters. As also stated in an L.A. Unleashed article written by Orange County journalist Janet Kinosian, a rescuer named Kelly Gibson from San Diego saw Nico's portrait, and acted on it. She operates a small rescue out of her home called Puggles and Pitties and is very active in animal transport. The dogs she rescues are either rehomed by her or transported to other rescue facilities that can adopt them out. Gibson is no stranger to the shelter reality, but seeing Nico's picture affected her deeply. "So much emotion was conveyed in that picture," she said. "He looked so defeated and had totally given up on life. He had lost all hope. He had a rough life and now found himself in the awful South L.A. shelter. Things were going from bad to worse, and I knew he had no chance of making it out alive. He seemed to know it, too. Plus, the shelter had noted on his record that he was dangerous, a biter, aggressive. But all I saw was a dog that had gotten a really bad chance at life." She traveled to Los Angeles to meet Nico, armed with plans to adopt him herself, take him to her own vet and have him humanely euthanized. "I just couldn't stand the thought of no one showing him a simple kindness in his life and thought he deserved to die with more dignity and respect than he would ever be shown in the shelter," Gibson said. But the minute she walked up to his kennel and looked into Nico's soulful, bi-colored eyes, Gibson knew this dog was not just misjudged, but full of life. He gave her kisses and, despite being sick and filthy, acted sweet as a lamb. Gibson knew right then that this dog needed help, and she was going to make it happen. "I changed my plan and decided he needed to be given a chance at life and not just put down," she said. Thanks in part to money raised by Audet, Gibson worked with The Mutt Scouts and bailed Nico out of Los Angeles' South Central animal shelter. He went into veterinary care as he waited for Gibson to coordinate his transportation to the Humane Society for Hamilton County in Noblesville, Ind. She has worked with the shelter's executive director, who has a soft spot for Pits, and together, they arranged for Nico's new life. It took weeks and 45 people to finesse the cross-country deal, but it happened. Nico arrived at the humane society safe and sound. There, he began his training and rehabilitation in search of his forever home. But who knew his journey to a new life would also inspire so many others along the way? "He has touched many hearts and he is even changing people's minds," said Deena Hitchens Crouch, a board members with the Humane Society for Hamilton County. "After meeting Nico, [people] couldn't believe how gentle and sweet he was, especially after what he had experienced." And what he experienced was a terrible life of neglect and abuse on the streets. Scary enough for any dog, but for a deaf dog, the days and nights must have been endless. Thanks to his foster care through The Invisible Fence company, Nico worked extensively with trainer and foster mom Julie Case to get him acquainted with rules, manners and commands. Showing what a smart dog he is, Nico picked up his lessons quickly. In November 2009, Nico was nearly ready for a forever home. The majestic boy had come so far. He looked like a different dog from the one that sparked his life-saving Internet campaign. Many people, having seen that photo, wanted to adopt Nico, but the one who eventually did had no idea that this dog was a celebrity of sorts. Meet Bridget Swan of Indianapolis. She and her partner Melissa Garris were looking for a special-needs bully-breed dog to adopt, and so a co-worker sent Swan the Hamilton County Humane Society's page on Nico. It was the first Swan had seen of this survivor. She immediately fell for him. "I always root for the underdog," Swan said. "Seeing [Nico's] picture and reading his story on the HSHC website made me want to rescue him and provide a good, stable environment for the rest of his days. When I called and asked if I could go for a visit, I could not believe he was still available. He has a spirit about him and I think that is what attracted me to him once I actually met him." Swan raced down to the shelter the next day to meet him and fill out paperwork. She was surprised when, initially, the shelter was not keen on adopting Nico out. The staff feared he would be pursued based on his popularity, so they made sure Swan wanted Nico, not just Nico the Internet Dog ("He has a Facebook page," Swan added with a laugh). Once they realized she was legit, Nico was hers. And they've all been bonded ever since. Swan and Garris work with a vibration collar so they can "call" his name; he'll immediately trot over to them and sit right down. "He has been trained, and is still training, with hand signals," said Swan. "He is doing so well!" Even though he faced mistreatment and abuse in the past, Nico holds no grudges in the present. "[Despite] Nico's scarring and the condition he was found in, he has forgiven man for everything that has happened to him," said Swan. "He is truly an example of a happy ending, even though this just our beginning." On one side, Nico behaves like a true gentleman. Yet on the other, he's still just a big guy. "He loves to sleep, snore, play in the snow, cuddle, snort and pass gas," Swan joked. "He is so amazing and has added so much stinky love to our lives!" He adores the snow, chewing, sleeping and his baths. Oh how he loves his baths! But perhaps the best thing Nico loves to do is snuggle. "He and I have started snuggling in the morning," said Swan. "It is so cute, I cannot put it into words." Nico is an original, and his story is a success. From street dog to death-row dog to rescued canine to adored family member. But everyone involved in his journey knows that there are lots of other Nicos in shelters all across the country, just waiting for their happy endings. "When someone goes to a shelter to find a pet, they are looking for the cute, well-maintained, spunky pet," said Swan. "They walk by the defeated, mistreated, infected and rough-looking dog. Maybe because they think the dog will misbehave, be aggressive or is not cute enough for them. "Nico represents a dog that, given a chance, can give more love to a home and his humans because he is more grateful to have them. I want people to see that all pets need love and a home that fits them."